Top-Op Sabudana is available in 300g bags. 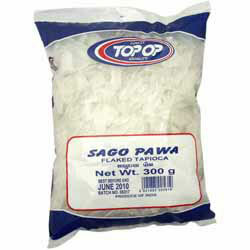 Also known as Sago Pawa and Flaked Tapioca. "Dear Spices of India, Opening the package from spices of india is like christmas day!!! They deliver high quality produce and fast... Service is outstanding. I highly recommend any 'curryheads' out there to use them. They won't disappoint."